↑ "New era as South Africa joins BRICS". SouthAfrica.info. 11 अप्रैल 2011. Retrieved 2 दिसम्बर 2012. ↑ "रूस-संयुक्त राष्ट्र". Ministry of Foreign Affairs of the रूसn Federation. रूस along with other developed countries reaffirmed the pledges to provide aid to developing countries (emphasis added). Retrieved 2011-10-17. ↑ Cooperation within BRIC. Kremlin.ru. Retrieved 2009-06-16. Archived 2009-06-19. ↑ Graceffo, Antonio (21 January 2011). 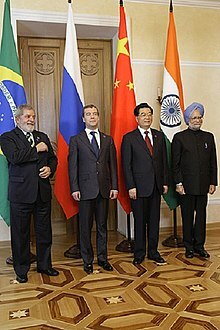 "BRIC Becomes BRICS: Changes on the Geopolitical Chessboard". Foreign Policy Journal. अभिगमन तिथि 14 April 2011. ↑ Blanchard, Ben and Zhou Xin (14 April 2011). "UPDATE 1-BRICS discussed global monetary reform, not yuan". Reuters Africa. Retrieved 26 April 2013. ↑ "South Africa joins BRIC as full member". Xinhua. 24 December 2010. अभिगमन तिथि 14 April 2011. ↑ "BRICS countries need to further enhance coordination: Manmohan Singh". Times Of India. 12 April 2011. अभिगमन तिथि 14 April 2011. ↑ "BRICS should coordinate in key areas of development: PM". Indian Express. 10 April 2011. अभिगमन तिथि 14 April 2011.